www.printerstock.com Save on receipt paper, pos paper, pos ribbons, and all of your pos supplies. In-Stock Items that are ordered prior to 2:00 p.m. Eastern will be shipped the same day (pending payment approval). Orders received after 2:00 p.m. or on Saturday, Sunday, or on Holidays will be shipped the next business day. FREE shipping for all orders totaling $50.00 or more. You may "mix and match" and combine items from our www.printerstock.com website to qualify for FREE Shipping. Shipping methods: United Parcel Service (UPS), FedEx or Freight Carrier LTL (less than truckload). All orders may be tracked via UPS or FedEx tracking number or Freight Carrier "pro" number listed on your order. We reserve the right to choose the best (lowest cost) method of shipment on all orders that qualify for FREE Shipping. All orders ship from the closest of our national distribution or suppliers warehouses. All sales orders are based on delivery to a commercial (non-residential) address. Extra charges for residential delivery and special freight delivery charges may apply and will be billed as incurred. UPS and FedEx Ground: Your order will be processed (pending credit card approval) within 24 hours of being placed, if placed Monday - Friday. Orders placed Saturday - Sunday will be processed the next business day. A business day is Monday - Friday, except holidays. 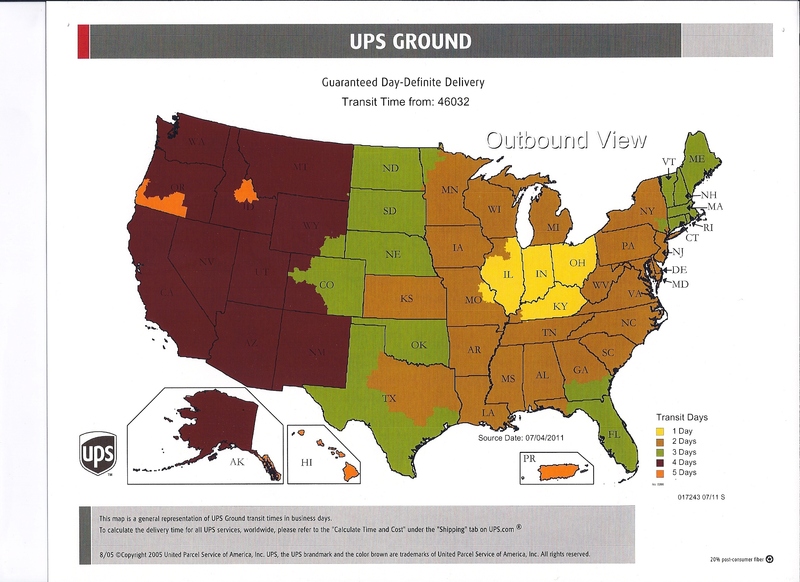 Customers can expect delivery 1-5 business days after the order is entered and credit card approval is obtained (see UPS Ground time in transit map below). Orders placed before 2:00 pm Eastern Monday - Friday will be shipped the same day. Orders shipped via UPS and FedEx services cannot be delivered to P.O. Box addresses. Please make sure to provide a physical shipping address. UPS 2 Day Air: 2nd Day Air orders will be processed (pending credit card approval) within 24 hours of being placed, if placed Monday - Friday. Orders placed Saturday - Sunday will be processed the next business day. A business day is Monday - Friday, except holidays. Customers can expect delivery 2-3 business days after the order is entered and credit card approval is obtained. Orders placed before 2:00 pm Eastern Monday - Friday will be shipped the same day. Orders shipped via UPS services cannot be delivered to P.O. Box addresses. Please make sure to provide a physical shipping address. UPS 3 Day Air: 3 Day Air orders will be processed (pending credit card approval) within 24 hours of being placed, if placed Monday - Friday. Orders placed Saturday - Sunday will be processed the next business day. A business day is Monday - Friday, except holidays. Customers can expect delivery 3-4 business days after the order is entered and credit card approval is obtained. Orders placed before 2:00 pm Eastern Monday - Friday will be shipped the same day ship the same day. Orders shipped via UPS services cannot be delivered to P.O. Box addresses. Please make sure to provide a physical shipping address. UPS Next Day Air: Next Day Air orders will be processed (pending credit card approval) within 24 hours of being placed, if placed Monday - Friday. Orders placed Saturday - Sunday will be processed the next business day. A business day is Monday - Friday, except holidays. Customers can expect delivery 1-2 business days after the order is entered and credit card approval is obtained. Orders placed before 2 p.m. Eastern Monday - Friday will be shipped the same day. Orders shipped via UPS services cannot be delivered to P.O. Box addresses. Please make sure to provide a physical shipping address. Canadian Orders: Orders to Canada are shipped via UPS. Orders will be processed (pending credit card approval) within 24 hours of being placed, if placed Monday - Friday. Orders placed Saturday - Sunday will be processed the next business day. A business day is Monday - Friday, except holidays. Customers can expect delivery 5-7 business days after the order is entered and credit card approval is obtained. Your order may be subject to import duty or taxes. Applicable taxes or duty are the responsibility of the recipient at the time of delivery. IMPORTANT: printerstock.com reserves the right to hold or cancel any orders so long as the credit card number used to order is not charged. For all orders shipped outside the United States the billing address of the credit card used must match the shipping destination address.